Today I have a little vintage before and after for you. I found this top a long time ago and something didn't seem right about it. It was super cute, but the fit seemed odd. This is one of the issues when it comes to pre-owned items, sometimes previous owners have done strange things to them for unapparent reasons. If you own a home or you've spent any time browsing open houses, you know how common this is with homes. With this top, one of the ties had been moved to the front. Once I figured out that it was supposed to wrap, I removed the tie and re-sewed it on the side. Look how cute it is now! This will be in the shop next week. 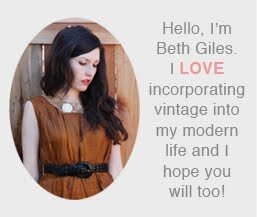 I hope you all have a lovely weekend and if you live in Southern California, you really should come to the vintage sale tomorrow, it's going to be grand! 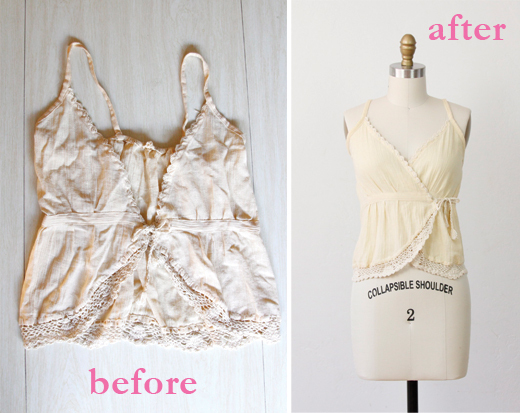 It's amazing what a little TLC and an ironing can do for a top. The wrinkled odd shape on the table sure looks unappealing, it's a 1000X improvement on the mannequin. Beth you sure have a good eye for pieces and see their potential!